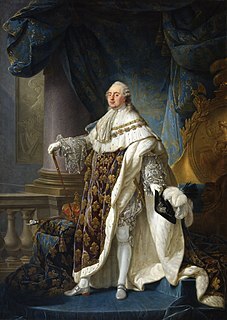 Louis XVI, born Louis-Auguste, was the last King of France before the fall of the monarchy during the French Revolution. He was referred to as Citizen Louis Capet during the four months before he was guillotined. In 1765, at the death of his father, Louis, son and heir apparent of Louis XV, Louis-Auguste became the new Dauphin of France. 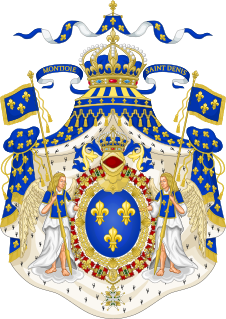 Upon his grandfather's death on 10 May 1774, he assumed the title "King of France and Navarre", which he used until 4 September 1791, when he received the title of "King of the French" until the monarchy was abolished on 21 September 1792. The Edict of Fontainebleau was an edict issued by Louis XIV of France, also known as the Revocation of the Edict of Nantes. The Edict of Nantes (1598) had granted the Huguenots the right to practice their religion without persecution from the state. 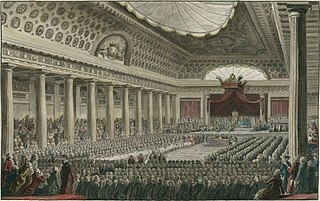 Though Protestants had lost their independence in places of refuge under Richelieu on account of their supposed insubordination, they continued to live in comparative security and political contentment. From the outset, religious toleration in France had been a royal, rather than a popular policy. 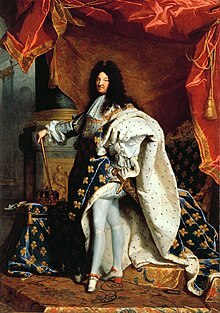 The lack of universal adherence to his religion did not sit well with Louis XIV's vision of perfected autocracy: "Bending all else to his will, Louis XIV resented the presence of heretics among his subjects." During the sixteenth and seventeenth centuries, politiques were those in a position of power who put the success and well-being of their state above all else. During the Wars of Religion, this included moderates of both religious faiths who held that only the restoration of a strong monarchy could save France from total collapse, as rulers would often overlook religious differences in order to have a strong country. References to individuals as politique often had a pejorative connotation of moral or religious indifference. The concept gained great currency after 1568 with the appearance of the radical Catholic League calling for the eradication of Protestantism in France, and by 1588 the politiques were seen by detractors as an organized group and treated as worse than heretics. The Huguenot rebellions, sometimes called the Rohan Wars after the Huguenot leader Henri de Rohan, were an event of the 1620s in which French Calvinist Protestants (Huguenots), mainly located in southwestern France, revolted against royal authority. The uprising occurred a decade following the death of Henry IV, who, himself originally a Huguenot before converting to Catholicism, had protected Protestants through the Edict of Nantes. 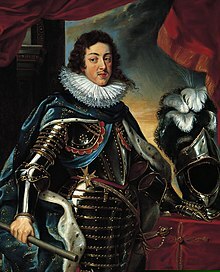 His successor Louis XIII, under the regency of his Italian Catholic mother Marie de' Medici, became more intolerant of Protestantism. The Huguenots tried to respond by defending themselves, establishing independent political and military structures, establishing diplomatic contacts with foreign powers, and openly revolting against central power. 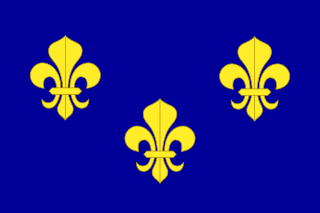 The Huguenot rebellions came after two decades of internal peace under Henry IV, following the intermittent French Wars of Religion of 1562–1598.